Asaba—The Delta State Government has denied online publication of a feud between Governor Ifeanyi Okowa and former governor of the state, Chief James Ibori, describing the allegation as untrue and a fabrication. “The general public, especially the Peoples Democratic Party, PDP, faithful, supporters of Governor Okowa and Chief Ibori should please disregard the mischievous publication. “Our findings revealed that the report was largely influenced by the major opposition party in the state. The DESIEC Bill 2017 when passed into law, according to the majority leader of state House of Assembly, Tim Owhefere will further guarantee credibility and substantially enhance electoral process in the state. This is very important and should be supported and encouraged by all Deltans. “It is the constitutional duty and responsibility of the executive arm of government to ensure good governance in the state through powers, functions and responsibilities assigned to it by the constitution and other enactments. It follows that the executive as part of its functions can initiate executive bills and it is the duty of the legislative arm of government to scrutinise such bills, debate and modify, reject or pass such bill into law. The legislature has always exercised its powers without inference by the executive arm. 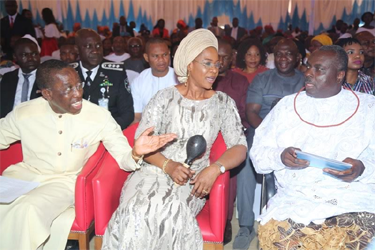 The post No feud between Okowa, Ibori – DELTA GOVT appeared first on Vanguard News.